This is getting to be quite a lot of fun! 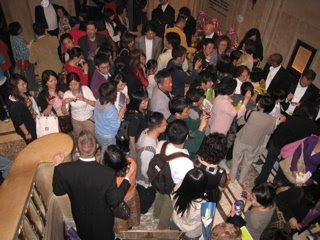 A big crowd tonight in Shanghai, many of whom had been last night as well. You couldn't wish for a warmer and more vociferous response. Our program was "Sounds of America" ( aka "Wondrous Free.") When we came out for our encore ( which the titles had NOT announced this time) somebody yelled out "Molihua!". Word seems to have spread..so we obliged. The Chinese folk song encores seem to be much appreciated, as does Jace's virtuoso announcement in Chinese at the beginning. In the dignitary room before the show were a Vice Mayor of Shanghai ( whose daughter sings in an a cappella group), Professor Zhou Xiao Yan of the Shanghai Conservatory ( where we will go tomorrow morning en route to the airport) and a young and famous Qun Opera actor who said he had come because he likes to learn from all kinds of performing. 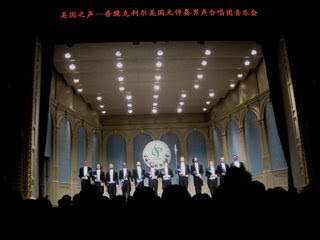 Choral singing seems to be growing in China - there were a lot of young people who identified themselves as singers, as well as members of an elder chorus, and many people clearly just discovering this kind of performance. 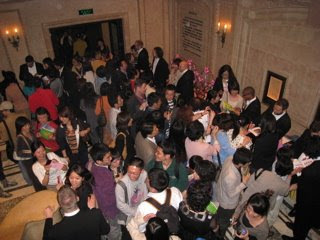 Chinese audiences like us. Maybe Beijing is another matter - we'll know soon enough.